DC NearlyWeds: Out of Hibernation - A Matter of Dates/Restaurants? Out of Hibernation - A Matter of Dates/Restaurants? Here I am, Miss JeffMemorial. The MIA bride here at DCNearlyweds.com. I am back, though. It has been a rough couple of months, but the holidays proved to be happy and revitalizing. I feel as though I need to completely re-introduce myself as things have changed, haha. 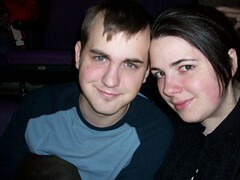 Mr. JeffMemorial & I: Our Unofficial Engagement Photo/At a Capitals game, heh. Known each other since we were nineteen. (Awww.) Young professionals living and working in Washington DC, mother and father to a crazy Scottish Terrier. We became the JeffMemorial couple because our original plan was to be married at the Jefferson Memorial in early October of 2009. Then something funny happened that we should have seen coming and never really thought of. Mr. JM's birthday is on October 18th. Mama JeffMemorial (my mom) has her birthday the next day on the 19th. My birthday is on October 26th. Then Halloween is on the 31st. This year's run through October was insane enough, and we could not imagine doing all of that plus a wedding this year, and then throwing a wedding anniversary in there every year to follow. Our solution? Move it to November. But then.... November is too nice/cold/rainy/spastic to actually plan an outdoor wedding without some fear of Mother Nature explosions. It had to go inside to accommodate our new November 7, 2009 date plan. To shorten an already long story, we moved everything to our reception venue, Local 16, and then another tragedy struck. Not money. Not even the location. Originally we were thinking of having a child-free wedding and then realized we wanted his nephews involved in the ceremony and part of the family festivities at the reception. Local 16 is not a child-friendly location. It killed us to move it, because Local 16 really is beautiful. But the wedding is about having those who are important there and the joining of families. His nephews had to be there. We moved it. Thankfully for the last time. Date set and reserved at our new venue. If you want to be specific, we're now actually more like Mr. & Miss OldTown (for Old Town Alexandria), although I love the Miss JM moniker, as it reminds me of where we've come from in this process. This is because our venue for the wedding and reception is in a place that was the most unlikely venue and it has turned out to be perfect. "The Internationally Famous Fish Market of Old Town Alexandria"
Really, I approached the event coordinator of the Fish Market on a whim. I was stressed beyond comprehension. We had been settled on Local 16 for months. We were making that work, working within their budgets, etc. And then we needed to change everything. With this economy picking at all of our wallets, we needed a place that stayed within our budget, but we didn't want to sacrifice having a beautiful and unique wedding. Finally I thought, hey, I know we had our hearts set on being in DC, but I had taken Mr. JM to Old Town, and he fell in love. Mr. JM had grown up in around Annapolis and the Eastern Shore, and I grew up in DC and in Northern Virginia. Old Town is like the perfect blend of the two. A seaside historic town (like Annapolis) with the Virginia charm that I love. Our first date in Old Town was actually at the Fish Market, which oddly enough is a restaurant I had been going to with my mom since I was about six years old. It was one of my FAVORITE places to go to eat growing up. The night we were there, they were having a big private party in their upstairs dining room. The thought crossed my mind briefly while I was pulling my hair out at work, trying to sort through where the heck we were going to have our wedding. I perused the website to see if they had any sort of indication that they did big events, as one of the GREATEST things I've learned through all of this is that restaurants can be fabulous wedding and/or reception venues that tend to be less expensive (if you're needing to mind your wallet) because generally you pay for just the food and drinks, with maybe a rogue cost for clean-up, but I haven't come across those kinds of fees in my research. In addition, you may find the cost to be less, but the quality of the venue can be just as lovely as a hotel ballroom, country club or what-have-you. Plus, it's one stop shopping. It's your venue, your caterer, your bartender, and many times your linen vendor, as well. They also may have good recommendations for other vendors, such as DJs, florists, etc. While I knew all of this going into considering the Fish Market, I was still skeptical. While it is considered a requisite stop for visitors and locals alike in Old Town, as well as a landmark, it's not the fanciest place by any means. Imagine my surprise when I saw the space dressed and arranged for events on their website. While it's not the set up we want, you could really see how the space could be utilized. I contacted their coordinator and practically bit my nails down to the quick; a place like this couldn't be that affordable, but I had to wait and see. And it was! It was perfect! Mr. JM loved it. I loved it! Our families loved it! They're giving us the entire top floor instead of just one room, so we'll have a room set up with the food (an appetizer buffet) and the bar, and the room pictured above set up for seating, dancing and our ceremony. We haven't had to cut our guest list, and in fact since we moved it from Local 16, we were able to increase it, due to our menu set up and increased space. Their event coordinator their is incredible. Answers every question, really personable and easy to chat with. She's fabulous and is so creative. We have free reign in terms of set up, etc. I have never dealt with such an accommodating, nice and flexible venue, and given the amount of people I have had to speak with in regards to this wedding. Given the fact that we have been attempting the impossible (a wedding in the DC area for around $5k), I've had to talk to so many venues and people. I guess I'm just so happy for us. One of the things we promised ourselves is that we were not only going to pay for the wedding ourselves, we were going to continue with our debt management plan and put nothing on credit. A pipe dream, seemingly, but nope. Ironically we're having the wedding of our dreams and are able to invite those we really want there, and all for $4k, including my dress and our honeymoon hotel cost for Colonial Williamsburg. That was a lot more long-winded than expected, but hey, Miss. JeffMemorial is back! Awesome work! Old Town is so wedding friendly too with so many great places to take photos (and maybe better parking than U St??). We recently moved from the west coast to Old Town Alexandria. We love it here, but having a hard time planning our wedding within our small budget. I was actually thinking of the Fish Market and glad to hear it is going to work out for your wedding. We might have to look into it. The charm of Old Town is great. this is really great! we're in the same exact place except just started planning and trying to figure it all out. we were really beginning to think 5K wasn't doable locally. glad to hear it is. i would love to hear more about the research you've done. congratulations!